The Willie Mullins-trained Cadmium put up a brilliant performance of jumping and galloping to run away with the G3 £140,000 Randox Health Topham Chase over the Grand National fences. Ridden by Paul Townend, for whom it was a first winner over the Grand National fences, seven-year-old Cadmium was an 8/1 chance. He beat Sub Lieutenant, trained by Henry de Bromhead and ridden by Rachael Blackmore, by six lengths. Mullins was winning the Randox Health Topham Chase for the second time, having first taken it in 2002 with Its Time For A Win. He said: "That was very good. He was going at his own speed limit, but you'd have to worry, watching him, if he'd stay. His jumping was phenomenal. He was very clean, and Paul got a great line. He [Townend] was very good at the Canal Turn with the loose horse near him. "I think we'll keep him at that sort of trip, rather than run him in the National next year - I think he runs to free for that sort of distance. On Cadmium's owners, Supreme Horse Racing Club/K Sharp, Mullins said: "They are great to train for - a great bunch. They don't have huge expectations, they really enjoy their racing and are delighted when a horse wins. We all know we are lucky to have horses like these; they don't have super-expensive horses, they have middle-of-the-road horses that anyone can have." The Willie Mullins-trained Cadmium (8/1) was the impressive winner of the Randox Health Topham Chase. Ridden by Paul Townend, the seven-year-old son of Early March, jumped well throughout the two mile and five furlong contest and ran on strongly in the closing stages to score by six lengths. The rider said: "Cadmium was deadly, wasn't he? He was fairly lit up before the race but it was not a bad thing because I was able to get a position and hold it early on. I got into a beautiful rhythm and it was straightforward. "You can only go as fast as they are able. Luckily, this lad has a little bit of class and he was able to go that gallop within himself. "This is brilliant. Like I said after the Gold Cup, you dream of riding big winners on TV. The race is something special over those fences and I had not got close to riding a winner over them until today. Hopefully, it is a good omen for tomorrow." "I got into a great rhythm early - Cadmium has a little bit of class and I was able to get into the positon I wanted to be in early on. He just loved it, he winged from fence to fence and gave himself breather whenever he needed. He was getting lonely up the straight as much as anything. "You usually know after the first or second what kind of ride you are going to get. The way he took them on, he was deadly. He was measured but was attacking them at the same time. It's a joy to ride a horse like him that takes those fences that well. It's a different buzz to riding any other race. "We got low at one of the ditches but, on the whole, you would take one mistake doing a lap around there. "It's daunting running into all the noise and you are running into a tunnel. He had a little look but, once I grabbed hold of him and got the rail again, he wasn't for passing." Townend has enjoyed a fine season, the highlight of which was capturing the G1 Magners Cheltenham Gold Cup aboard Al Boum Photo, also trained by Mullins. He partners Pleasant Company for the Closutton handler in tomorrow's £1-million Randox Health Grand National. Discussing his ride in the world's richest chase, he said: "I've been having a brilliant season and hopefully Pleasant Company can go well tomorrow. I can go into the race tomorrow with a bit of confidence now having ridden a winner over here. 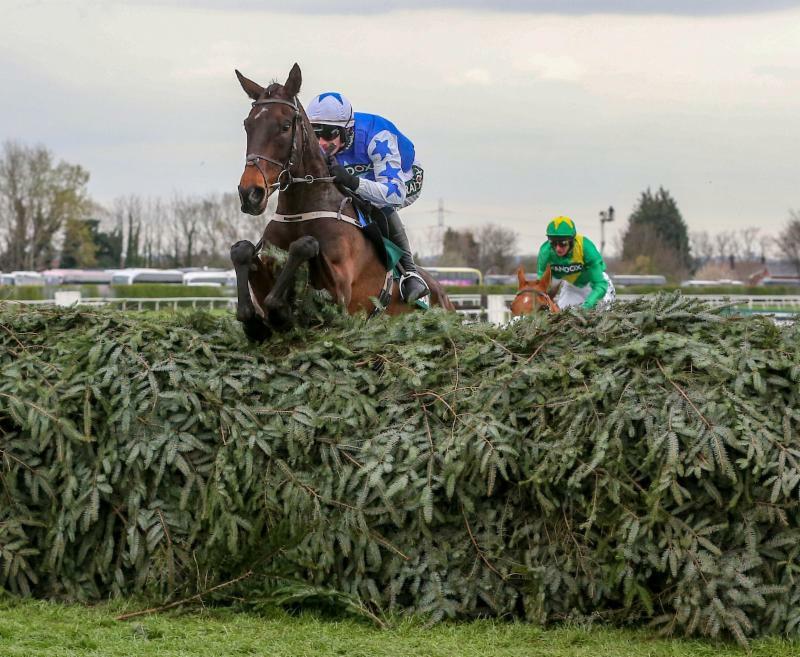 "I think the ground is good to soft on the Grand National course and it is proper jumping ground." Henry de Bromhead has no regrets about sidestepping this year's Randox Health Grand National with Sub Lieutenant, but he saw enough encouragement in the 25/1 chance's six-length second to all-the-way winner Cadmium (8/1) in the shorter Topham to be planning already for next year's big race. De Bromhead said: "I'm delighted with that. He ran a blinder. It looked like he struggled to lay up with them most of the way so we might have him back for the big one on the Saturday next year. "He was in this year's National, but thought we would have a go in this first. He's taken to the fences really well. He loved it and jumped brilliant." Jockey Rachael Blackmore, who rides Valseur Lido for De Bromhead in tomorrow's big race, added: "I had a great spin, and he jumped great. It was class. He really took to the place." The 9-2 favourite Janika finished a creditable fourth for Nicky Henderson and the Simon Munir & Isaac Souede partnership. Jockey Daryl Jacob had no excuses and was proud of the six-year-old, who was the youngest in the field but was burdened with top-weight. He said: "I was very happy with him. I thought he was going to be second at the elbow but the weight just told in the end and he got tired on me." The current star of Paul Henderson's 20-strong stable near Whitsbury in Hampshire took him to the winner's enclosure at Aintree today. Doitforthevillage (25/1) finished third in the Randox Health Topham Chase, having warmed to his task over the big spruce fences and appearing to be a possible winner turning for home under Tom O'Brien. Pace-setting Cadmium (8/1), who went on to win, was not for stopping however, and Doitforthevillage was denied second on the run-in when passed by runner-up Sub Lieutenant (25/1). Janika (9/2f) took fourth - the distances were 6l, 3¼l and the same. Henderson said: "He's a lovely horse and a great jumper, but Tom said he felt he just lost his confidence a bit going away from the stands. Then he started to learn how to jump them properly - he was trying to go through the fences and couldn't cope with it, but then he picked it up. "We felt he could make the places - he's been in pretty good form all year and we've been very pleased with him. He was second at Ascot to Cyrname, the highest-rated horsein the country, and things didn't go well for him at Cheltenham where a rival fell right in front of him and he had to do too much to get into position. "Apart from that he hasn't run a bad race all season. Last season he had two bouts of an infection in a leg and we didn't get a full run at things - we had to start and stop and even ran him twice over hurdles to try to get him ready, but this time we've had a clear run and he's been sound all the way. He's a great horse for the yard. "He's a good two-miler who we now think gets two and a half miles. He's a quick jumper, and we'll be thinking of bringing him back here in December for the Grand Sefton Chase. In the meantime there is a Sussex Champion Chase for horses rated nought to 145 at Plumpton at the end of the month and worth £50,000. If we get rain we might run him there, but he needs cut in the ground." The Worshipful Company of Farriers in conjunction with the Aintree Executive and The Jockey Club created a Best Shod Award in 2016 - the first time such an award had ever been presented on a racecourse in Tthe world. The award is in recognition of the farrier's skill in shoeing and preparation of the horse's feet, all of which contributes to the welfare of the horse which to everyone in the Racing Industry is of the utmost priority.